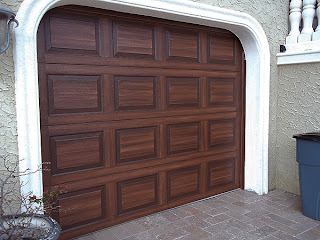 I am working this week and next on painting two single garage doors to look like wood. 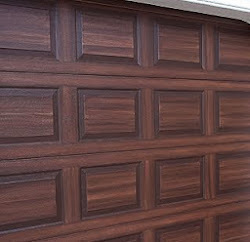 There is also a solid regular door on the side of the garage that I am painting to look like wood also. In this first picture you can see where I have already cleaned, primed and base coated the doors. 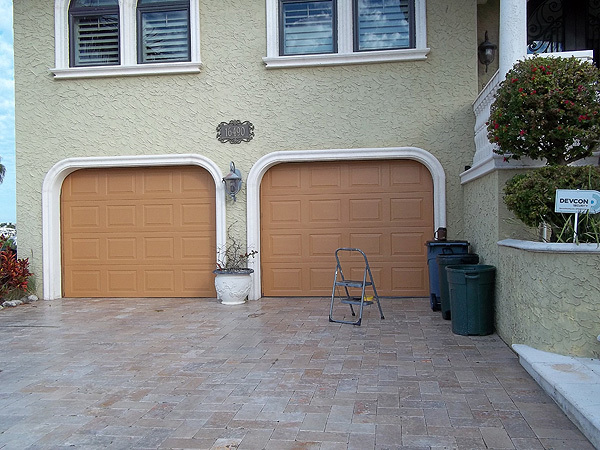 This home is on the beach so I really cleaned the doors well (as usual). I scrubbed them with soap and water and then rinsed that off then scrubbed them with an ammonia and water solution. At that point they were really clean and free of any salt residue or dirt. Then I primed them and applied the base coat of SW Smokey Topaz. 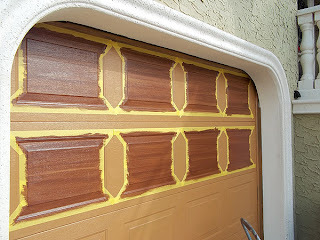 In the next picture you see how I tape off the panels on the garage door for the first application of the wood grain color paint, on this door I am using SW Terra Brun as the wood color. In order for the garage door to like wood you will need to tape off a lot. There is no other way to accomplish a professional looking door. 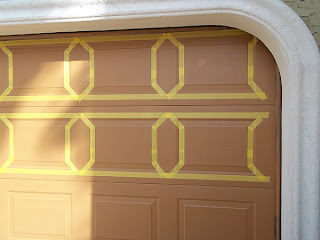 On a single garage door like this one I use about 2 rolls of 1.5 inch low tack tape. I only use the tape designed for delicate surfaces. The reason is I will be taping over painted surfaces fairly soon after they are painted. 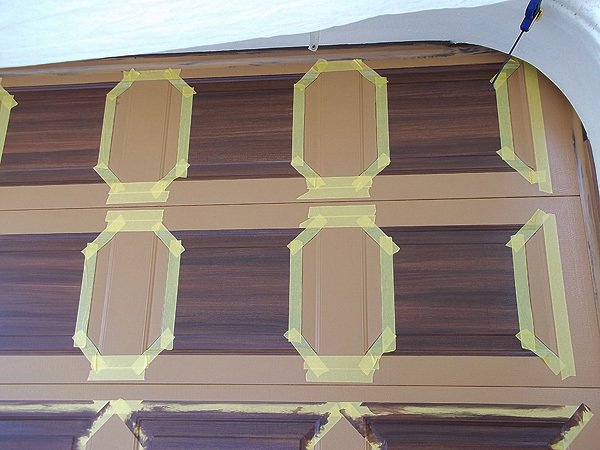 I tape off the individual panels in this manner because I want the wood grain pattern to be horizontal on them. The space between the panels I want a vertical grain pattern so I will be doing that later in the day. 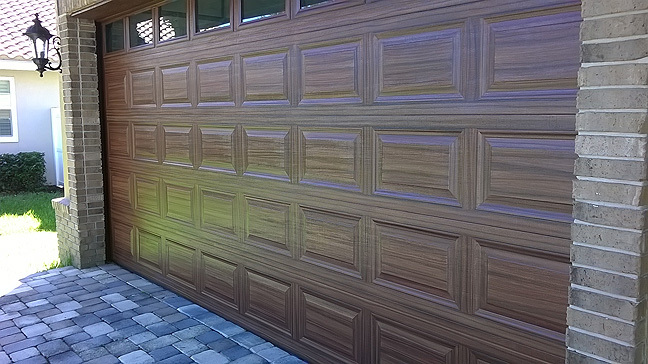 In this next photo you can see where I have applied the first of the wood color and you can see the horizontal grain pattern. This photo also shows how I have left the areas between the panels blank for the time being. The taping off allows you to keep the stroke going past where you want it to end ensuring a nice clean crisp edge to the wood look. I typically work on the top two rows of panels at the same time. 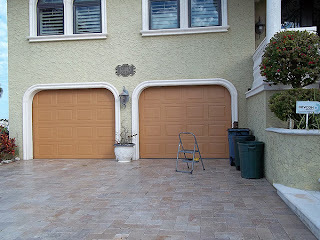 Then when they are done I raise the garage door and work on the bottom two rows. Its waaaaaaaaaaay easier to work standing up then trying to paint the bottom rows working on your hands and knees. There is also another practical reason to work on only 2 rows at a time. While I am working on the bottom 2 rows the top 2 rows are drying, so by the time I get back to them for the vertical areas the paint is dry enough to tape over. Now the first thing to see in the next picture is the color change. That's because I always use at least 2 colors for the wood. What I do is take the Terra Brun and mix it with black about 1:1 or maybe even a little more on the black side. Then I again paint that over the first coat of the Terra Brun using my discretion to make some grain lines darker that others. 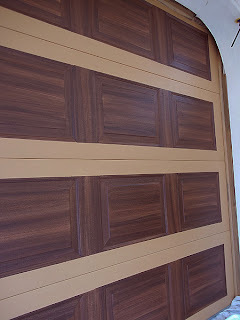 Using 2 colors gives the wood a much richer look to it. So in this next photo you can see where I have removed the tape from the top two rows and then taped the vertical areas. 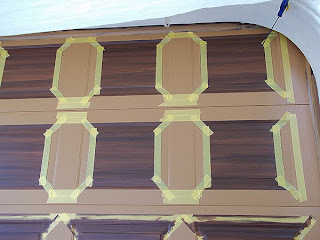 In order to tape off the vertical areas I have to tape over the freshly painted panels. This is about 1 to 1.5 hours after they were first painted and that is why you want to use the tape for delicate surfaces. I also leave about a 1/16th of an inch exposed so that when I paint in the vertical areas that 1/16th of an inch gets over painted but no blank areas will be left. So then same deal, first one color then the second color. Now when you take off the tape you want to be careful and pull the tape back on itself to take it off. Don't just pull it straight off towards you, bend it back like 180 degrees and pull it back over itself slowly. So here we are in the next picture with both the horizontal and vertical areas of the panel rows complete. Now I have to paint the horizontal areas between the rows in and then the on each end of the door I paint that area in a vertical pattern. One last touch and I'm done. And that last touch is to do what I call 'picture frame' each panel. In order to do that I take the darker mix and thin with water as I paint on the beveled part of each of the panels. You can clearly see what I am talking about in the next photograph. You don't want to go to dark here but if you look at the photo above and the one below you can see how nicely this sets off the door.